Pop into our showroom and take one for a test-drive! 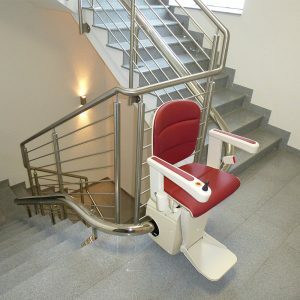 One of a range of straight stairlifts available from Somerset Stairlifts & Mobility in Taunton. 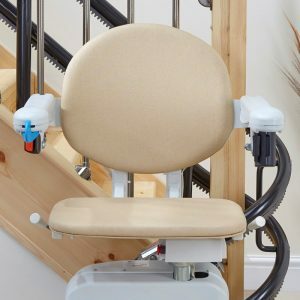 For customers requiring a powered chair lift the Simplicity Plus is a stylish solution, designed to overcome the challenge of climbing straight stairs. 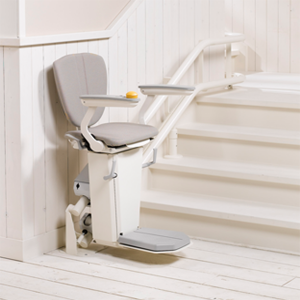 The Simplicity Plus stairlift offers you all of the basic functions that you would expect from a stairlift plus optional upgrades including a ‘powered seat swivel’ and a ‘folding footplate’. 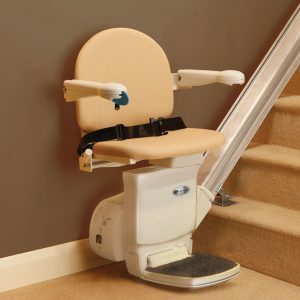 It can be provided with a manual hinge system so if you have a doorway close to the bottom of your stairs this solution prevents the track from causing an obstruction. 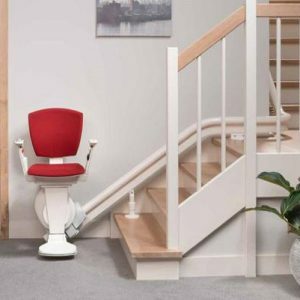 The Simplicity Plus is installed directly onto your existing staircase – so no dirt or dust during the installation process. 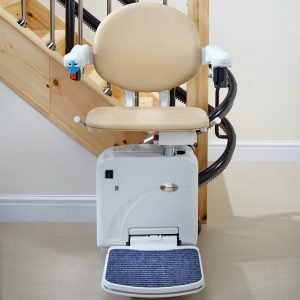 Our engineers take less than a day to install any of our stairlifts, once fitted, we vacuum up any debris and take all of the packaging away with us when we leave. 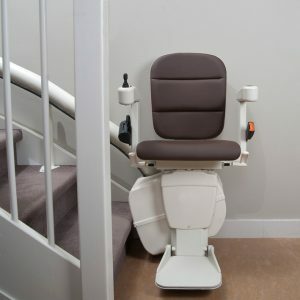 Offers you all the basic stairlift functions. 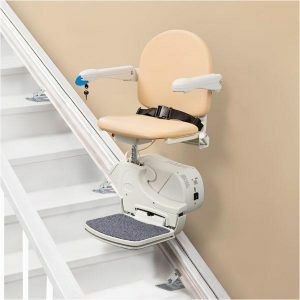 Plus the option to upgrade to a powered seat swivel and / or folding footplate. Optional manually operated hinged track. Choice of six different upholstery colours. 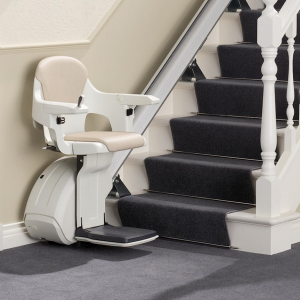 Fitted to the stairs, not the wall, so no need to redecorate following installation. 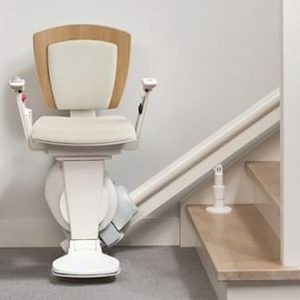 Battery backup – stairlift will continue to work in the event of a power cut. 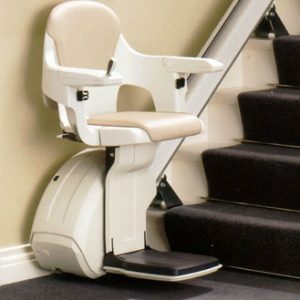 Compact unit folds up leaving the staircase free for other users. 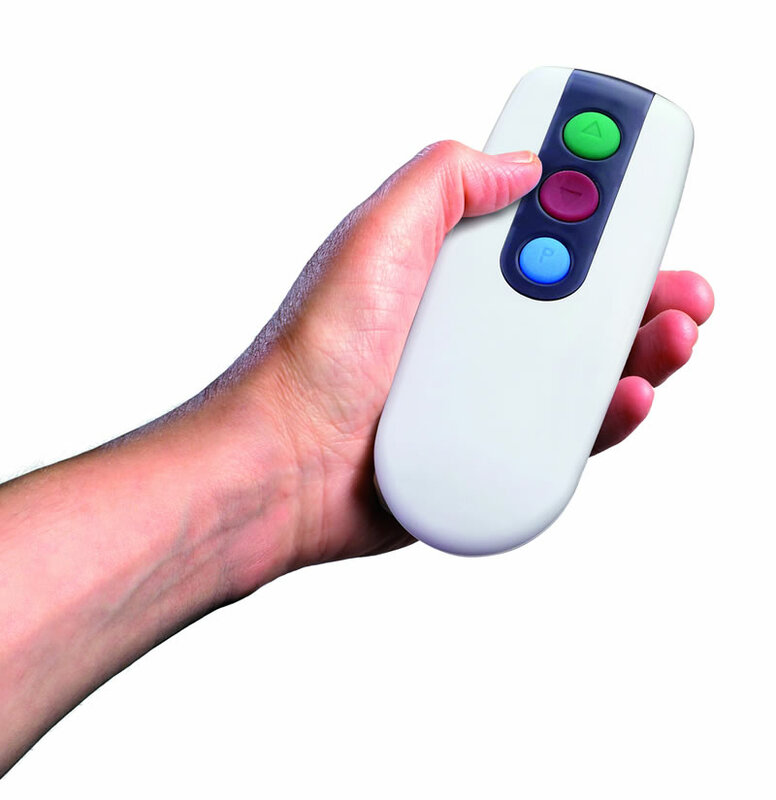 Supplied with two remote controls. Once folded, the unit can be moved along the track freeing up space in the hallway. 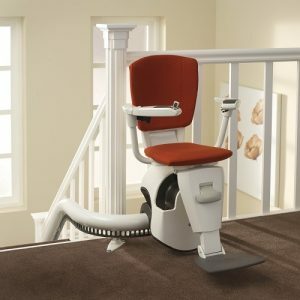 Safety sensors stop the stairlift if it meets any obstruction on the stairs. Easy release retractable seat belt for added security and peace of mind. 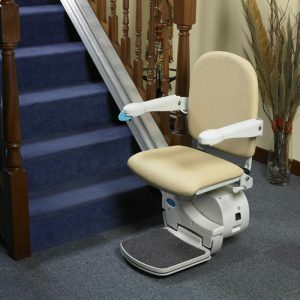 Easy to use operating unbreakable toggle moves the lift smoothly up and down the stairs. 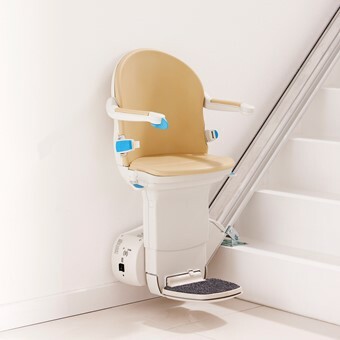 Conveniently located control leaves both seat arms clear to provide unhindered support when getting on or off the seat. Our showroom is open from Monday to Friday from 9.00am to 5.00pm and from 9.00am to 1.00pm on Saturday mornings. We are easy to find in Frobisher Way TA2 6BB, just of Bindon Road (near the Silk Mills junction) – with car parking spaces just outside our showroom.